Stratasys is pushing the boundaries in digital dentistry with the availability of 3D printing technology for use with bio-compatibale materials in dental laboratories. Stratasys has released a series of newly integrated additive manufacturing innovations intended to boost accessibility of professional-grade 3D printing technology across a wider range of dental laboratories. These systems are specifically designed to help advance lab service offerings, cut production times, reduce costs and support mass adoption of digital dentistry. Based on award-winning PolyJet triple-jetting technology, the Stratasys Objet260 Dental 3D Printer offers cutting-edge functions for laboratories across all departments. With the power to 3D print three different materials on a single tray, the system has the versatility necessary to build surgical guides, models and appliances for a variety of patient requirements. When operating in single-material mode, operators gain production efficiency with shorter change-over and reduced material waste. Its affordability is ideal for mid-sized labs looking to expand service offerings, while not impacting versatility. 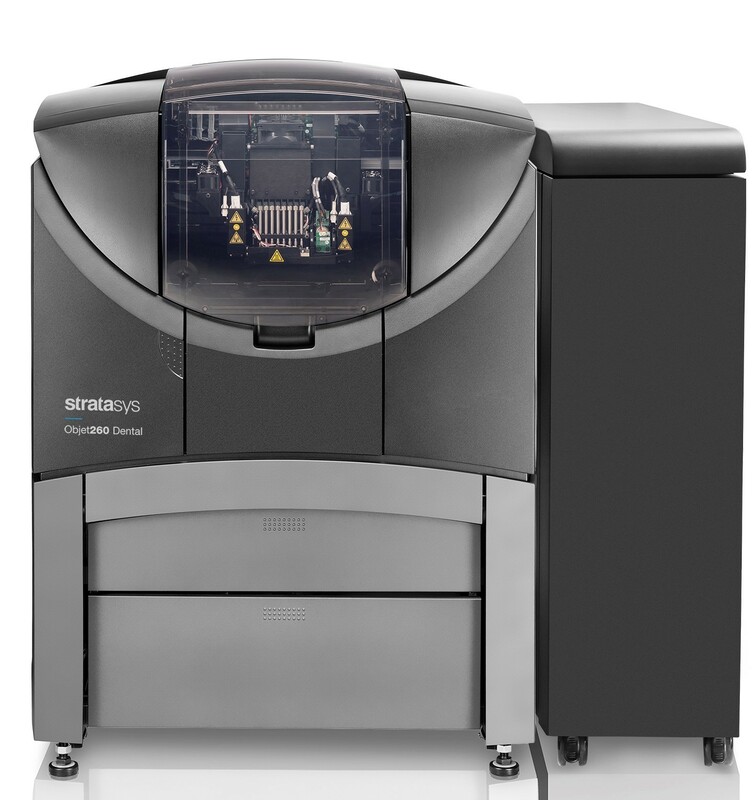 Future-proofing current investments, the Stratasys Objet260 Dental 3D Printer is additionally upgradeable to “Dental Selection” – broadening adoption of next-generation digitally mixed materials. Stratasys is currently exclusively demonstrating two new products aimed at further increasing laboratory productivity. The first is a flexible biocompatible material, MEDFLX625 – allowing dental and orthodontic laboratories with PolyJet multi-material 3D printers to custom mix both flexible and rigid biocompatible materials for short-term patient contact direct print applications, such as indirect bonding trays. In addition, MEDFLX625 is built to help laboratories further increase efficiencies by 3D printing both surgical guides and soft-tissue implant models during a single print run.